Have you considered moving to Ireland? If you are a nurse, you’re in luck! Virtual Expos online recruitment fair for registered nurses and midwives takes place on 24 January 2017. Nurses and midwives as well as other professionals working in healthcare are highly sought after in Ireland and are eligible to work here. Please see the Highly Skilled Eligible Occupations List for more information. With Virtual Expos you can meet potential employers, interview with them, and even secure a job before you leave. Whatever profession you are in, international experience always a bonus. Nursing is no different. Working overseas is invaluable for future employment when you return home. It also tells employers that you are the kind of person who relishes a challenge and rises to meet it. No matter where you work or live, you’re never too far from the countryside in Ireland. 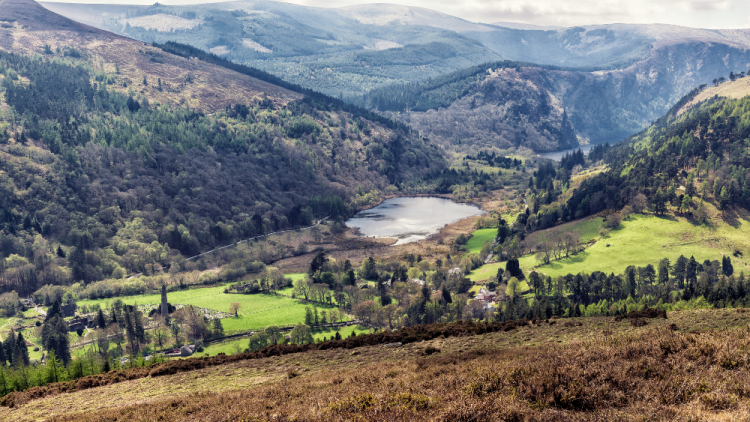 Dublin may be a thriving city, but half an hour’s drive will bring you to the beautiful Wicklow Mountains. An hour and you’ll be at the stunning Glendalough valley, pictured above. In Ireland, breathtaking landscapes abound. In addition, there are plenty of outdoor activities. Hiking, surfing and cycling are all very popular. Not that long ago the vast majority of people living in Ireland were, well, Irish. In the past few decades however, Ireland has become increasingly multicultural. The free movement of EU citizens accounts for most immigrants into Ireland, but there are significant numbers of people from further afield. Between April 2015 and 2016 a total of 79,300 people immigrated to Ireland. Foreign nationals, and their contribution to the economy and society, are welcome. Compared to many countries across the world Ireland is very safe. The 2016 Global Peace Index ranked Ireland the 12th safest country in the world. Guns are illegal, and gun crime is rare. Paris, Berlin, Vienna, Prague and London… all of Europe is a short, low-cost flight away. That means it’s easy to spend a weekend in one of Europe’s cultural capitals… or party hotspots! Furthermore, Ireland is the closest European country to the United States of America. Because of this, it is relatively easy and inexpensive to visit the US too. Yes, it rains a lot, but bear with us. Ireland has a mild climate. That means that the summers aren’t exactly scorchers, but the winters are rarely freezing either. The weather is changeable, and on occasion, you can experience all four seasons in one day. Because of this, the weather is an unending source of conversation. At least you’ll never run out of something to say! Craic – pronounced “crack” – is Irish for fun. News, gossip, jokes, music and enjoyable conversation are all craic. Craic is an important part of Irish sociability as it adds to the quality of life. After all, fun is a fundamental part of a happy life.